In 2005, my wife Michele started noticing a few unusual physical and mental changes in me. They were so minor, I didn’t really think I had a serious problem and just shook it off as stress. As the year progressed my symptoms became more prominent, especially the constant tremor in my left hand. It was time to see the doctor. I was officially diagnosed with Parkinson’s disease. My symptoms for the first few years were relatively minor…. It was more of nuisance than anything and as long as I took my medication people at work didn’t notice. It wasn’t too long until my symptoms became more evident to those around me. The tremor, rigidity, slow movement, and freezing were now affecting my ability to perform my responsibilities. Increasing my mediations did help and my “ON” time was better. I never officially announced that I had Parkinson’s due the fact that despite the diagnosis, I was in denial and thought it would end my career. As it later turned out I was wrong on one count and correct on the other. In April 2010, after five years, I was let go. I was devastated. After a life of challenges and success in an eclectic career, it all just came to a halt. The rest of that year was spent in self-pity. I took my medication but was motivated to do little else. Time in front of the TV and computer did little for my domestic life or my waistline. Frankly, in retrospect, I don’t know how my wife Michele put up with me and the extra 80 pounds. That is some kind of love. 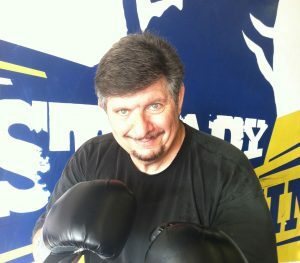 Michele has always been health conscious and in January, 2012, she surfed the ‘net for the latest info on Parkinson’s and came across Rock Steady Boxing. She “strongly suggested” that I check it out as a form of exercise and to get me in a social environment with others dealing with PD. Knowing she was at the end of her rope, I agreed to check it out.